Russian President Vladimir Putin has ordered the withdrawal of Russian troops from Syria. He gave the command during a surprise visit to Khmeimim Airbase in Syria’s Latakia province on Monday morning. 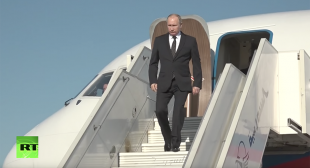 The Russian president was met by his Syrian counterpart, Bashar Assad, and Russian Defense Minister Sergey Shoigu at the airbase, which houses Russian forces assisting Syria in the battle against Islamic State terrorists (IS, formerly ISIS). The Russian leader said that in the space of two years the Russian and Syrian militaries have “defeated the most battle-hardened grouping of international terrorists.” Putin added that he had made the decision that a significant number of the Russian military contingent in Syria should return to Russia. He warned that should the terrorists try to “rear their heads” in Syria again, Russia will strike them as “they have never seen before.” The Russian leader added that the conditions for a political settlement under the auspices of the United Nations had been created in Syria, and that refugees were returning home.